Prosecutors have said Braszczok participated in the Sept. 29 attack by shattering the SUV’s back window. He was off duty at the time. Attorney John Arlia didn’t immediately return a message seeking comment. Video captured the moment as about two dozen riders slowed down, swarming the SUV and blocking its path. Some dismounted and approached the vehicle. Police said some of the bikers then began damaging the Range Rover. The SUV driver, who police say was frightened for his family in the car, suddenly lurched forward, plowing over another rider before heading north. The cyclists gave chase, pursuing the driver for about 2.5 miles. The chase ended when the SUV exited the highway and got stuck in street traffic. 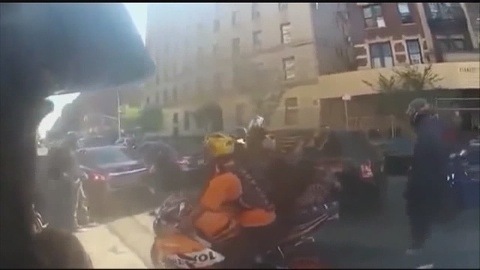 The video showed one biker smashing the driver’s window with his helmet. Police said the group then pulled the man from the SUV and beat him, although that part isn’t shown on the video. The police department confirmed that the video is authentic. The SUV driver, Alexian Lien, 33, was not charged and his wife said he feared for his life. The biker who was struck as the SUV fled, Edwin Mieses Jr., of Lawrence, suffered broken legs and has spine injuries that will leave him paralyzed, his wife said.